Now we know: Instead of looking down, he started to look up. 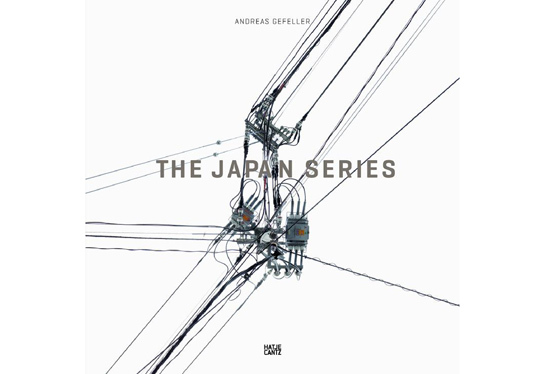 To be more precise, during a visit to Japan, Gefeller noticed the ubiquitous power and telephone lines, and he started to produce images of those. There’s one thing missing in the final images: The poles that hold those cables and boxes up. The absence of those poles immediately transforms the results into something as alien as Gefeller’s earlier images: Something is very familiar, yet it looks very strange. Make no mistake, photographs of power lines have been taken before, by many different photographers (even I have a set of negatives floating around somewhere…). But Gefeller manages to take things to a different level. These new images have now been published as The Japan Series. I imagine it must have been a huge temptation to produce a very glossy, shiny book of those electrical contraptions. It’s technology, after all, and we like our technology shiny and glossy. But the book is the complete opposite, using a thick cardboard for the covers and matte paper for the contents. It’s very interesting how this does yet another transformation, because the feel of the book is almost organic. Almost. But just that fact that it’s not a shiny book gives the work such a different, other dimension. At times it even makes you forget a little that you are looking at photography. Of course, that is one of those crucial ingredients in photobook making: Knowing that even seemingly small choices can make a big difference. This entry was posted in Book reviews, Conscientious, Contemporary Photography, Uncategorized and tagged Alien Images, Boxes, Cables, Contemporary Photography, Contraption, Contraptions, Digital Cameras, Japan Series, Littl, Mistake, New Images, One Thing, Photographer, Photographers, Photographs, Photography., Shtick, Small Pieces, Source Images, Surfaces, Telephone Lines, Temptation, Thick Cardboard, Visual Surveys on April 22, 2011 by Joerg Colberg. I’m delighted to present Food For Your Eyes summer show program and highlighting ten visions to tell our world…and life. This entry was posted in Contemporary Photography, food for your eyes, Uncategorized and tagged Alexander Gronsky, Australian Photographers, Black Sea, Contemporary Photography, Esther Levine, Europeans, F-stop Leipzig, Felix, Felix R.Cid, Flore, Flore-Aël Surun, Food For Your Eyes Slideshow, Graham Miller, Group Show, International Photography, Jens, Jens Olof Lasthein, Joerg Brueggemann, juliana Beasley, Leipzig Germany, Love Stories, Mean Streets, Olof, Photo Group, Photographer, Photographers, Photographs, Photography Festival, Photography., Rockaway Park, Splendour, Szabolcs Barakonyi, Temptation, Visions, White Sea, Will Steacy on June 26, 2009 by food for your eyes.